One of the things I love about travel is that I tend to get a chance to catch up on back issues of Scientific American. This trip is no exception. Over lunch, I read an article in the June 2007 issue called “The Traveler’s Dilemma”, by Kaushik Basu. In it he explains research on why people give what seem to be irrational responses to the game called, “The Traveler’s Dilemma”. I’m going to use the forum of this blog post to propose an alternative answer, one not suggested in his article. Lucy and Pete, returning from a remote Pacific island, find that the airline has damaged the identical antiques that each had purchased. An airline manager says that he is happy to compensate them but is handicapped by being clueless about the value of these strange objects. Simply asking the travelers for the price is hopeless, he figures, for they will inflate it. Instead he devises a more complicated scheme. He asks each of them to write down the price of the antique as any dollar integer between 2 and 100 without conferring together. If both write the same number, he will take that to be the true price, and he will pay each of them that amount. But if they write different numbers, he will assume that the lower one is the actual price and that the person writing the higher number is cheating. In that case, he will pay both of them the lower number along with a bonus and a penalty–the person who wrote the lower number will get $2 more as a reward for honesty and the one who wrote the higher number will get $2 less as a punishment. For instance, if Lucy writes 46 and Pete writes 100, Lucy will get $48 and Pete will get $44. What numbers will Lucy and Pete write? What number would you write? Before I give away the answer… think about what number you would guess. For whatever reason, I didn’t recognize this game, and I immediately jumped to the answer 98 for some reason. Mathematically, there is only one rational guess. It’s 2. Soon, however, it strikes her that if she wrote 99 instead, she would make a little more money, because in that case she would get $101. But surely this insight will also occur to Pete, and if both wrote 99, Lucy would get $99. If Pete wrote 99, then she could do better by writing 98, in which case she would get $100. Yet the same logic would lead Pete to choose 98 as well. In that case, she could deviate to 97 and earn $99. And so on. Continuing with this line of reasoning would take the travelers spiraling down to the smallest permissible number, namely, 2. It may seem highly implausible that Lucy would really go all the way down to 2 in this fashion. That does not matter (and is, in fact, the whole point)–this is where the logic leads us. The rest of the article dives into detail about different experiments that were executed to try and understand why people reliably do not guess the rational answer. I won’t repeat it all here, but it was a very impressive set of empirical studies. The one that impressed me the most was the experiment in 2002 by Tilman Becker, Michael Carter, and Jorg Naeve at the University of Hohenheim in Germany. They actually played this game, for real money, with 51 members of the Game Theory Society – all of which who were professional game theorists! But with real money at stake, 45 of the 51 chose a single number to play every round, and of those, only 3 chose the Nash equilibrium value (2). 10 chose 100, and 23 chose numbers between 95 and 99 (phew, I’m not completely off base). Now, this is where I think I have some value to add. The rest of the article theorizes that the unexplained choice of strategies of either 100 or the high 90s is based on an evaluation of altruism, an intrinsic human trait that may be hard-wired into our brains. If I were to play this game, I would say to myself: “Forget game-theoretic logic. I will play a large number (perhaps 95), and I know my opponent will play something similar and both of us will ignore the rational argument that the next smaller number would be better than whatever number we choose. What is interesting is that this rejection of formal rationality and logic has a kind of meta-rationality attached to it. If both players follow this meta-rational course, both will do well. The idea of behavior generated by rationally rejecting rational behavior is a hard one to formalize. But in it lies the step that will have to be taken in the future to solve the paradoxes of rationality that plague game theory and are codified in Traveler’s Dilemma. What if we, as humans, are hard-wired to “collaborate”. Collaboration, cooperation… these are nice words. Collusion is the variant where two parties actually pool efforts to control the outcome of a situation their personal advantage. My guess is that we are wired, either genetically or socially, to infer collusion opportunities when they present themselves. The rational choice might be 2, but even without talking to the other person, I might guess that they know, without talking, that if we just both guess 100, we will both win. Collusion without communication. The fact that the price for being wrong is just “2 dollars” is a relatively low price to pay versus the gain of “98 dollars” if I’m right about the implicit collusion opportunity. Even with loss aversion of 3:1, I’m going to guess 100. The guesses in the high 90s are likely a slight nod to the goal of squeezing out a couple of dollars of upside, but without risking the large $90+ upside of the collusive opportunity. In fact, I believe that the ratio of loss aversion and evaluation of the probability of silent collusion explains the guessing ranges displayed. Loss aversion is well known, but I’ve never considered the idea of implicit collusion before. It seems like a powerful idea to explain human behavior in games where communication between parties is prevented. Wow, people are really panicked. Here’s what happened. Yesterday, Citigroup analyst Prashant Bhatia wrote an extremely negative report on E*Trade based on their announcement of exposure to mortgage securities where he put the likelihood of bankruptcy at 15%. How he calculated this, I don’t know. Maybe he estimated their exposure and risk curve for their portfolio, and then he ran monte carlo simulations of possible futures. More likely, he squinted his eyes, held up his thumb, and said “1 in 7”. More coverage here in Business Week. In any case, I’ve had a few people email me today about whether or not their money is safe at E*Trade. 1) If you have bank accounts, they are FDIC insured up to $100,000. So if E*Trade folded tomorrow, you’d be able to open up a new account elsewhere, and the FDIC would wire money in (up to $100,000) within a matter of days. 2) The brokerage accounts are protected by SIPC up to $500,000. Not sure how the re-imbursement works, but I’m guessing it’s something like an insurance claim. 3) The brokerage accounts are protected by a separate insurance policy for up to $150M per brokerage account. None of these scenarios are likely – other brokerages & banks would be completely moronic to not buy E*Trade or it’s accounts for customer acquisition. E*Trade’s brokerage and bank business is doing quite well at this point. In fact, here is an article suggesting that this might be a great buying opportunity for the stock. So, unless you have more than $500K in securities at E*Trade and $100K in bank deposits at E*Trade, you are fine. Update (11/14/2007): The following letter was updated on E*Trade today, which details the complete protection of brokerage accounts up to $150M. 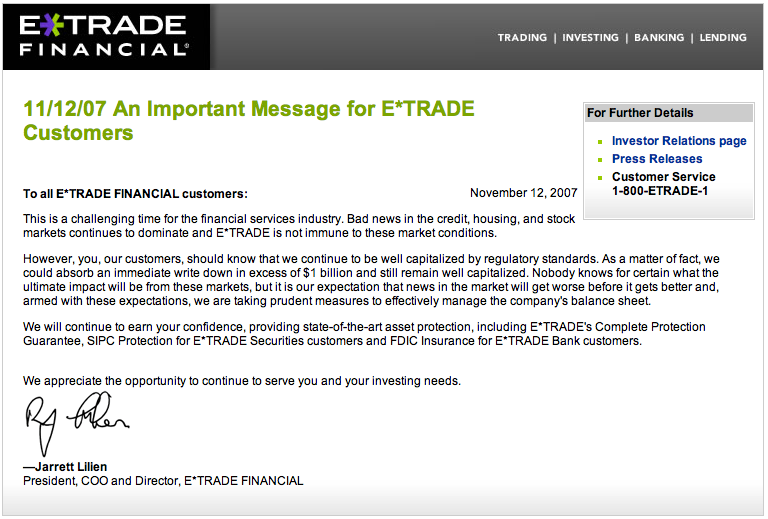 The old adage “there is no such thing as bad publicity” does not apply to E*TRADE FINANCIAL this week. 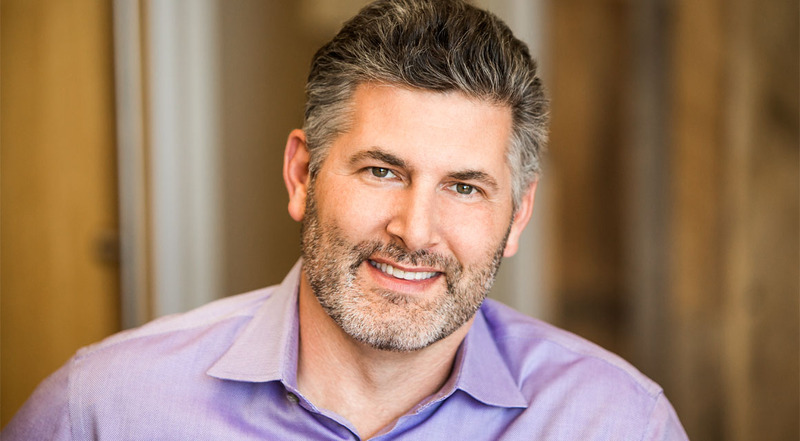 Seemingly by the stroke of a pen… or a few clicks from a keyboard… a Company with a core business that has generated impressive growth quarter after quarter has been bombarded by rumored reports of its imminent demise. Well, we want customers to know that the entire E*TRADE team has come together with resolve and commitment, taking appropriate and decisive action to manage through this issue and to ensure that E*TRADE FINANCIAL continues to deliver the best value in the marketplace for our customers. I have spoken with scores of customers over the past week. Many of you have openly expressed your confidence in E*TRADE. It is genuinely gratifying to know that our retail customers—the heart of our business—understand the value in our model and the strength of the franchise. FDIC insures all E*TRADE Bank accounts to at least $100,000 and Extended Insurance Sweep Deposit Accounts to $500,000. SIPC protects E*TRADE Securities customers up to $500,000 (including $100,000 for claims for cash). Additional E*TRADE Securities protection provides up to $150 million per brokerage account, underwritten by London insurers (aggregate $600 million). E*TRADE is well-capitalized by regulatory standards. E*TRADE was founded on the concept of empowering the individual investor. This value is still at the heart of our business. We look forward to continuing to provide you with the products, pricing, service and functionality you have come to expect in order to help you manage your financial world. We haven’t lost focus on our customers, our business or our future. The credit crunch has had a tremendous impact, but we are taking appropriate and decisive action to manage through it. Who knew David Pogue was a funny guy? This video cracked me up.